Dr Who, Soho and neoliberalism. Unicorns and the rise of the far right. Nick Field’s theatre work channels juxtapositions through strong visual images to explore massive ideological concepts. ‘I’m really interested in playing with ideas of things that might seem really disposable and kitsch as a way of exploring something that goes very very deep,’ Field tells me over Skype. He’s on a break from rehearsals for Paid Fantasist, which he is co-creating with Rebecca Biscuit from Sh!t Theatre. He seems surprisingly relaxed for someone who is opening not one, but two shows in the next three weeks at Camden People’s Theatre: his collaboration with Biscuit and a solo show, Unicorn Party. Paid Fantasist is the first time that Biscuit and Field (the name of their new company) have worked together. Collaborating so intensely with another theatre-maker is also a new experience for Field, who has previously worked as solo artist. As well as the fun they’ve had in developing a working practice for their company, Field thinks the collaboration has generated a ‘conversational quality’ and ‘new energy’ to Paid Fantasist. Biscuit and Field met four years ago through a clowning workshop and discovered they shared skills and approaches that complemented each other. In the show, Field tells me ‘there’s a moment where we become a 1978 performance art drag band, singing songs about neoliberalism in the Colony Room Club in 1978’. Paid Fantasist is then, dramaturgically and thematically, ‘pretty damn queer’. Nick Field’s solo show Unicorn Party sounds even queerer: ‘I start off being kind of like a unicorn stormtrooper and essentially it becomes drag throughout the show’, he tells me. He opened the show at the Harlow Playhouse in Essex and was conscious that ‘it’s very queer work and I was opening the show in a context that wasn’t necessarily framing that’, which can feel risky. He explains, ‘for queer artists, you have to have an extra awareness of the context you’re taking the work into and sometimes you’re like, “Ok, I don’t know how this is going to be received, I don’t know how people are going to take this”. This shouldn’t be a problem at Camden People’s Theatre, the next stop for Unicorn Party, which has built up a strong LGBTQ+ audience, through such initiatives as its Come as You Are Festival. Then again, he adds, ‘I also think it’s important to take queer work to people who won’t get to see it so much’. The idea for Unicorn Party came about a few years ago when Field noticed that unicorns seemed to be everywhere. While unicorns used to be ‘a queer symbol of self-acceptance and empowerment, that’s been co-opted and commercialised’ into something ‘cutesy’, pink and plastic. But what’s the connection between unicorns and fascism? ‘Unicorns throughout history have represented concepts of purity and purity is a major occupation of fascist thinking’, Field explains. In fact, Field’s research led him to realise that ‘the unicorn as a concept has been part of human experience since the very earliest civilisations’, recreated and reimagined by different cultures. ‘It seemed to me that unicorns actually offer a great opportunity to explore ideological threads across history, across cultures, but also across processes of commercialisation’. He does this through live music, storytelling and conjuring a unicorn Frappuccino onstage. Although my brain is now firing with all the representations of unicorns I can think of and their ideological significance, I’m still struggling to visualise what the show will actually entail. How would he describe his practice as an artist? He began his career as a playwright, so dramaturgy underpins the construction of his work, which also incorporates live music and contemporary performance. There is also a strong visual aspect to his shows; alongside his performance making, Field works as an art director with photographer Holly McGlynn. He moved from playwriting to performance via a brief detour through spoken word. However, he says ‘as a queer practitioner, I found it limiting very quickly’: ‘If there was a regular night of spoken word or performance poetry, I always felt I was invited if they were having a special gay night, which maybe they’d do once a year around Pride time’. He also found the form artistically limiting, although he acknowledges that spoken word and performance poetry have developed a lot since then. Theatre affords more space to expand upon ideas. 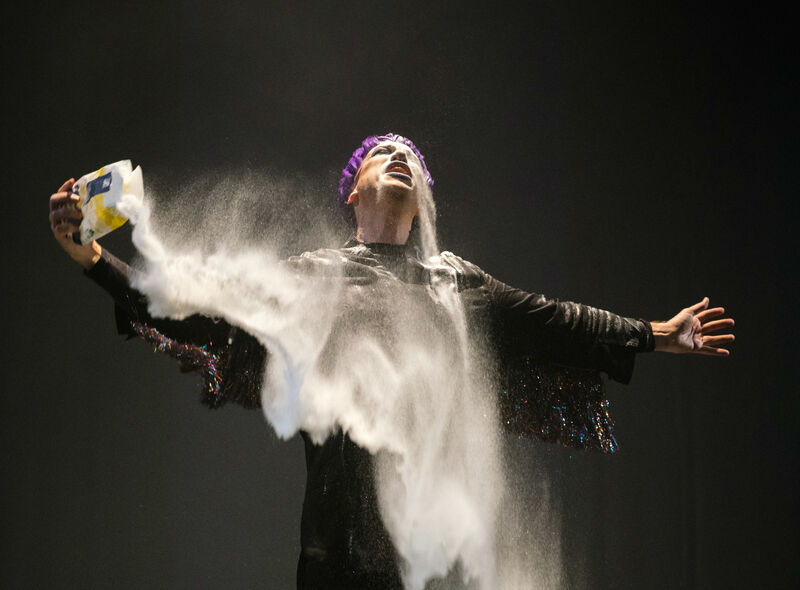 This brings us onto Pow!, a series of development workshops that Nick Field ran with support from Spread the Word to encourage emerging LGBTQ artists to experiment with the possibilities of live literature. I took part in this scheme and developed my first solo performance, a ten-minute piece about being shy. As someone who hadn’t performed since my role as chorus member in several school plays, I was pretty surprised to find myself telling a packed crowd at Bar Wotever at the Royal Vauxhall Tavern about my life and for them actually to find bits of it funny and relatable. Other performances in the showcase included a hilarious investigation of queer-women’s obsession with astrology by Lizzie Masterton and a slick fusion of drag and performance poetry by Alex Marlow. It’s important, Field explains, to have specific schemes for LGBTQ young artists to provide ‘a specific, supportive environment, where there’s a base level understanding of essentially where everyone is coming from, to some extent, so that we can develop work from there, rather than from a place of “do people get this?”’ I certainly found that making my show in a context in which my LGBTQ-identity was taken as a given, not something that needed to be explained, allowed me to experiment and take risks. There was a strong emphasis in the workshops on writing from personal experience; I felt like I could bring my whole self into the room. Field comments, ‘What we were able to achieve with Pow! was a context in which people felt they were able to be really open and honest. That really resonated in the work, which then in turn really resonates with audiences’. I should add that Field is a generous and dramaturgically astute mentor, and a great part of the success of the workshops was due to his facilitation with Katayoun Jalili. Field is a strong believer in the power of workshops to forge community, develop peer networks to support and grow work, and to find collaborators, which he suggests is particularly important for young LGBTQ artists. It is through finding this sustaining community that you can ‘be really clear about what your voice is and how you’re putting that out into the world’. Though Unicorn Party appears as a solo show, Field is quick to acknowledge the contributions of Billy Barrett and Rachel Mars who have worked on it with him. I’m reminded of what Peggy Shaw says in the introduction to her published solo shows: ‘I am a solo artist and, by virtue of that, a collaborator – “I would be nothing without you.”’ ‘You’ being the dramaturg, the designer, the audience… Perhaps this sense of an intimate, mutually nourishing ecosystem is particularly true of queer performance. Originally published on Exeunt Magazine.